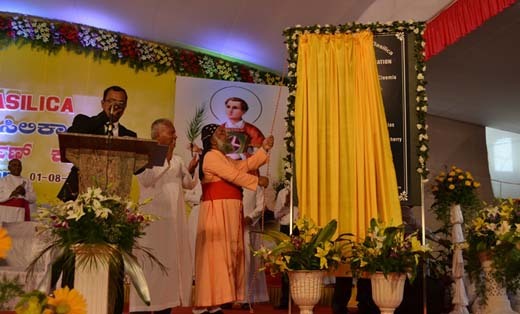 Karkala, August 01, 2016: The historic day in St. Lawrence Shrine in particular and Udupi Diocese in general dawned on Monday, 01 August 2016 as all the roads from the twin dioceses of Udupi and Mangalore led to the holy shrine to witness the solemn proclamation and dedication of the Shrine as Minor Basilica during the Holy Eucharist which was followed by public function. Devotees had started arriving at the Shrine right from the early morning from different corners of the twin dioceses. Different parishes had made their own arrangements to come to the Shrine hiring private buses. Many travelled by their own vehicles with family members, while others hired private vehicles and many more by public transport. 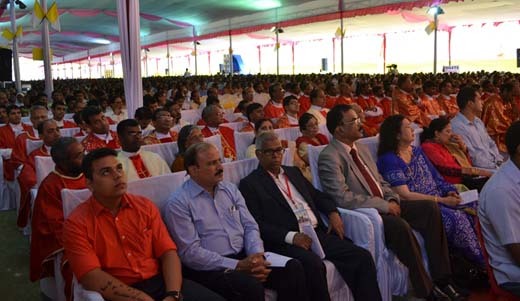 The huge pandal with seating arrangement for nearly 12,000 devotees was gradually filled up by 9.30 am. 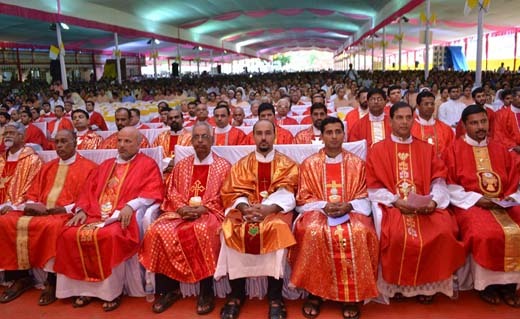 By the time the Holy Mass started, more than 15,000 devotees filled the venue many of them finding place inside both old and new churches and still more standing in open space by the side of the pandal. Prior to the solemn Eucharistic Mass, Rector of the Shrine, Rev. Fr. 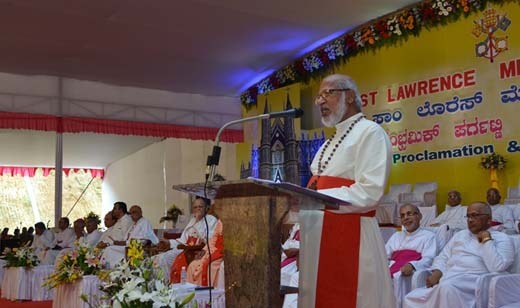 George D’Souza conducted the Novena Service in preparation for the titular feast of St. Lawrence which would be celebrated on 10 August 2016. 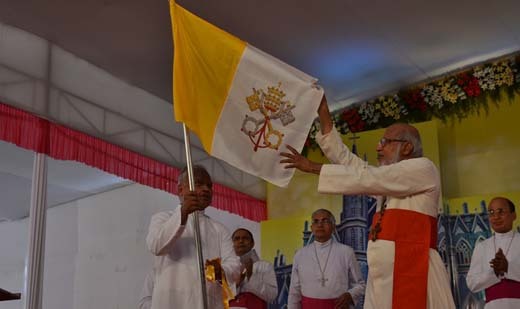 The Papal Flag was unveiled by Cardinal Mar George Alencherry. 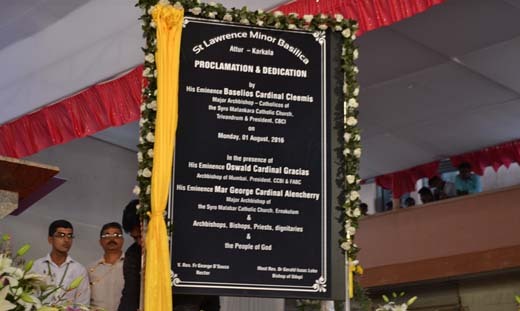 Speaking on this occasion he said that he had a great desire to visit the Shrine of St. Lawrence for a long time and he got an opportunity to participate in the Proclamation and Dedication of St. Lawrence Minor Basilica. 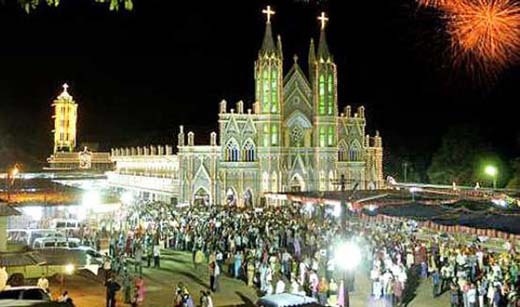 He further said that the holy sanctuary of St. Lawrence may become an all-India sanctuary to which devotees from different parts of India may visit this Minor Basilica. 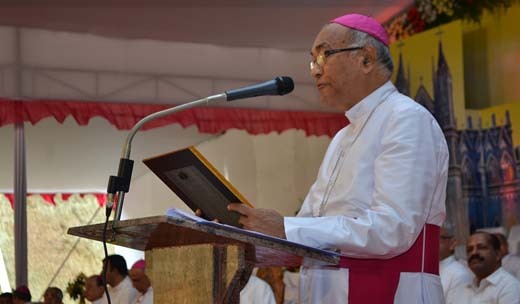 Archbishop Bernard Moras read out the special message from Pope Francis on the occasion of the Proclamation and Dedication of St. Lawrence Minor Basilica. 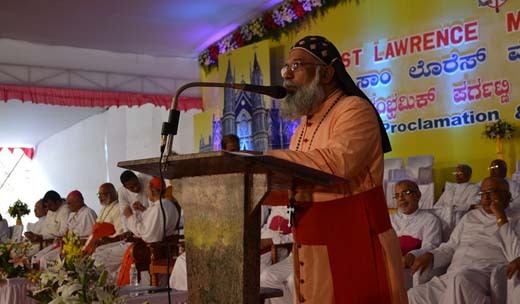 On behalf of the Karnataka Bishops Council, Archbishop Bernard congratulated Bishop Gerald Lobo and people of the Diocese of Udupi. 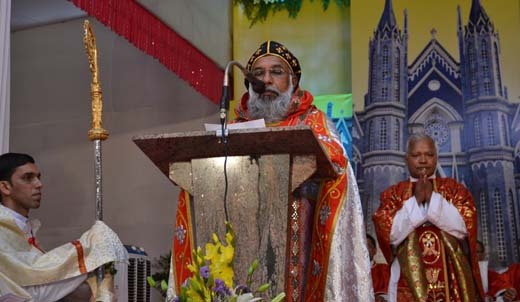 Bishop Aloysius D’Souza of Mangalore read the message from the Apostolic Nuncio, Rev. Dr. Salvatore Penacchio. The chalice sent by the Apostolic Nuncio for this occasion was handed over by Bishop Aloysius D’Souza to the Rector of the Basilica, Rev. Fr. 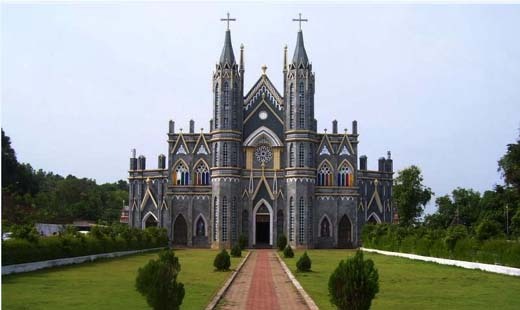 George D’Souza.Sri Sunil Kumar, MLA of Karkala said that the Shrine of St. Lawrence falling in his constituency has been a centre of pilgrimage and by its Proclamation and Dedication as the Minor Basilica, Karkala has come to be known throughout the country and the world. 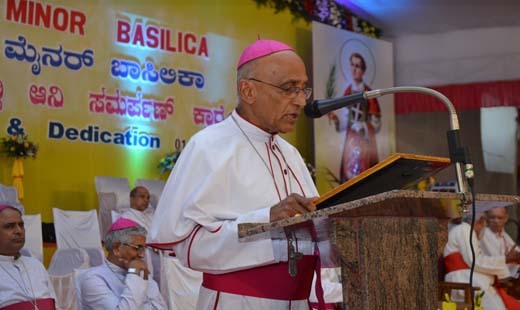 He further said that he is proud to know that out of 22 Minor Basilicas in India one of them is situated in his constituency. He assured full cooperation with the authorities of the Minor Basilica for providing various facilities to the devotees who would be visiting the pilgrimage centre. Sri Gopal Bhandary, former MLA of Karkala said that Karkala has historic importance. 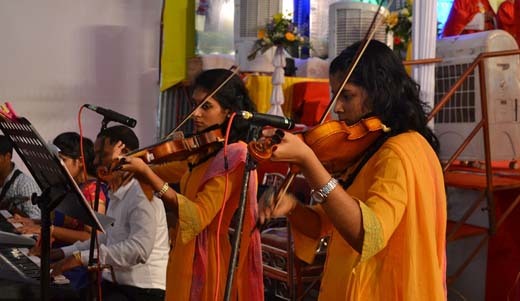 The annual feast attracts thousands of pilgrims irrespective of creed and caste. He further said that he has been visiting the shrine every year and has been impresed by the devotion, discipline and harmony among the pilgrims. The developmental work that has been going on at Attur under the inspiration of St. Lawrence and direction of Fr. George is really appreciable. 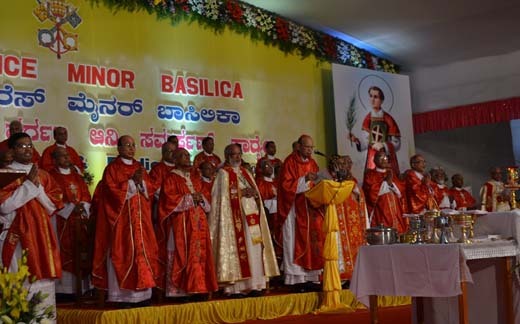 He hoped that the Basilica of St. Lawrence would promote communal harmony in the district, Karnataka and the country. Cardinal Oswald Gracias in his message said that it was a great joy to attend the occasion. Referring to the Pope, Cardinal Gracias said that Pope Francis has declared this year as the Year of Mercy and Compassion, so was St. Lawrence. He prayed that the devotion of St. Lawrence would spread more and more. 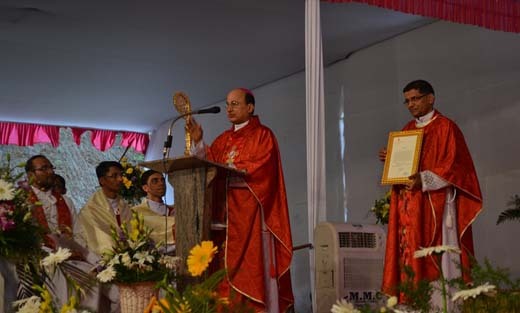 Bishop Gerald Lobo presented mementos to all the dignitaries on the dais. He also gave away mementos to the sponsors of the function. Rev. Msgr. Baptist Menezes proposed the vote of thanks. The public function was compeered by Rev. Fr. Denis D’Sa, PRO of Udupi Diocese and Dr. Vincent Alva, Professor of English Literature in the Milagres College, Kallianpur. Following the end of the public function, vegetarian lunch was served to all the devotees who had attended the Holy Mass and public function. Around 15,000 people received food peacefully and in disciplined manner served through around 30 counters. 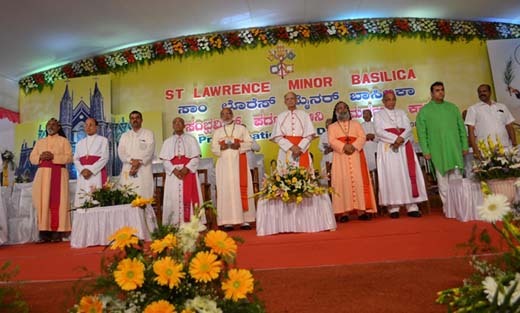 The entire function of Proclamation and Dedication of St. Lawrence Minor Basilica including the Holy Eucharistic celebration and public function covering three and a half hours was well organized by the organizing committee and enthusiastically participated by thousands of devotees. Hundreds of volunteers and police cooperated in maintaining the order. This was an historic event witnessed by thousands of people directly with great devotion and awe and viewed by many more thousands at homes through direct telecast.